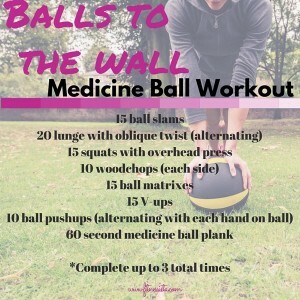 A total-body circuit workout you can do anywhere, using a stability ball and a pair of dumbbells. Hi friends! How’s the morning going?? Hope you’re having a great day so far! We’re off to the beach -it’s EXTRA gorgeous outside!- and spending the afternoon getting some Tucson stuff packed + Liv’s back to school goodies together. She requested a ladybug backpack… thank goodness for Amazon. 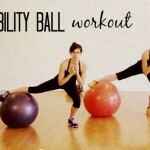 Today, I have an all-new stability ball workout for you! The stability ball is one of my favorite workout tools. It adds some balance challenge to many traditional exercises, and is a fun way to get different muscles (especially those deep core stabilizers) guessing. It’s also one of my favorite chairs. I’ll often sit on my stability ball to keep my core awake and engaged while I type away. Push-up and pike: keep in mind that the closer the ball is to your ankles, the more challenging this exercise is going to be. Make sure that your hands are wide and you’re pressing through your entire hand. As you bend your elbows, lower your chest towards the floor. Your elbows should go slightly back. Exhale and squeeze your chest to rise, so you’re in a plank position. Inhale, and as you exhale, lift your hips up towards the ceiling, keeping your legs as straight as possible. If the pike is too much, do a knee tuck instead. Bend your knees to bring them towards your chest, then extend back out to a plank position. Booty V raise: this is one of my all-time favorite moves! The ball will be on your low stomach; put it where it feels comfortable. Press your hands into the floor, and step your feet apart, so your legs make a “v” shape. Take an inhale, and as you exhale, squeeze your glutes to lift your legs off the floor and bring your heels towards each other. As you lower down, feet are wide (back in that “V” shape). Dumbbell Y’s and T’s: for this one, the ball will be in the same spot as your V raise. Use a light to moderate set of dumbbells. Take an inhale, and then as you exhale, keep your arms almost straight (slight bend at the elbow) and the weights up in line with your torso, making a “Y” shape. Lower down as you inhale, then exhale to bring them out (so your arms are perpendicular to your toroso; a “T” shape), and lower down. Alphabet plank: place your forearms on the ball and step your feet back, so you’re in a plank position. Keep your hips down in line with your torso and your neck long. Start the timer and begin to “draw” the alphabet with the ball. See how far you can get in 30 seconds 😉 If you need to take a break, lower your knees to the floor, take a deep breath, and pop back up when you’re ready. Hamstring curl and chest press: hold a pair of moderate to heavy dumbbells, and lie onto your back, placing your feet on top of the ball. Bring your arms to a 90-degree angle, and squeeze your glutes to lift your hips off the floor, with legs as straight as possible. Inhale, and then exhale to bend your knees in towards your booty, as you chest press the weights up, squeezing your chest. Inhale to lower to weights, and extend your legs. Keep your hips lifted the entire time. Single leg squat to lateral lunge: stand about 3-ft in front of the stability ball and place one foot back on the ball. (Stand close to a wall if you need to for balance.) Sink into a lunge position, making sure your torso stays upright and your front knee remains stacked over your front ankle. As you rise, straighten the back leg, and pivot your torso to perform a lateral lunge. Complete all of your reps on one side before switching to the other side. Full sit-up: start lying in a supine position with your feet on the ball. Keep your legs as straight as possible. Bring your arms overhead, take an exhale, and as you exhale, engage your transverse abdominis (deep core muscles) and keep your belly pulled in as you complete a sit-up. Complete all of the exercises in a circuit, moving quickly from one exercise to the next. 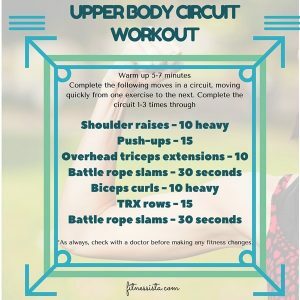 This circuit can be completed up to 3 times total. As always, honor your body and talk with a doctor before making any fitness changes. Please let me know what you think! 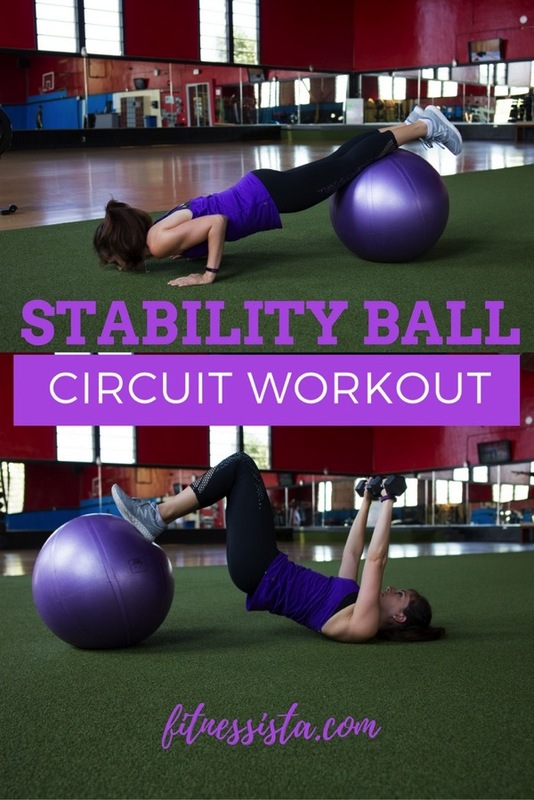 What’s your favorite stability ball exercise? I love chest presses on the stability ball! I can really feel my core working too! My favorite is working abs with the stability ball. Burns so good! Abs are my choice of workout on the ball!!! I love doing glute bridges – one legged and two! – on stability balls. I feel it in my glutes as well as my core. I love push ups on the stability ball. I’ll have to try your variation with the pike! I am basic and I love the stability ball crunch/ sit-up. Single Leg Hamstring Curls are my favorite SB exercise. I love the concentrated burn! Chest press and hamstring curl! It is the best of both worlds! My favorite SB move changes, but a few of my favs include single leg hamstring curls, chest press and in and outs. I love the push up to pike, and would love the mask!! Such a great workout. 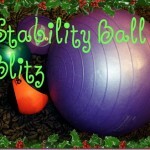 The stability ball is totally underused!